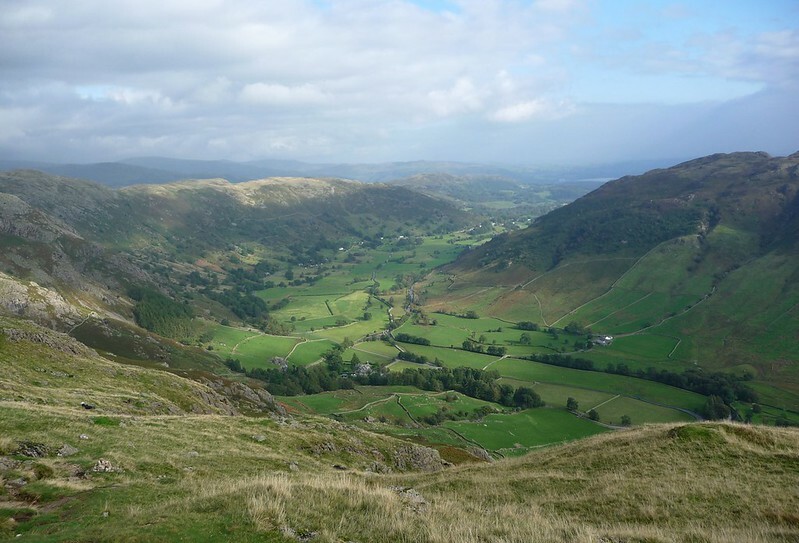 Back in October of last year we spent a glorious week walking around Langdale in the Lake District and just generally enjoying the great outdoors. Having lived in Wales for several years we are well used to mountains and hills but the landscape we found there was on another scale completely. From the flat river valley floor of Great Langdale speared almost vertical walls of rock whilst to the west we knew that Scafell Pike, the highest peak in England, was lurking somewhere just out of sight. That enigmatic mountain was our main target for the week but with low cloud blanketing the surrounding hills we needed to find somewhere at slightly lower altitudes while we waited for a day with perfect climbing conditions. 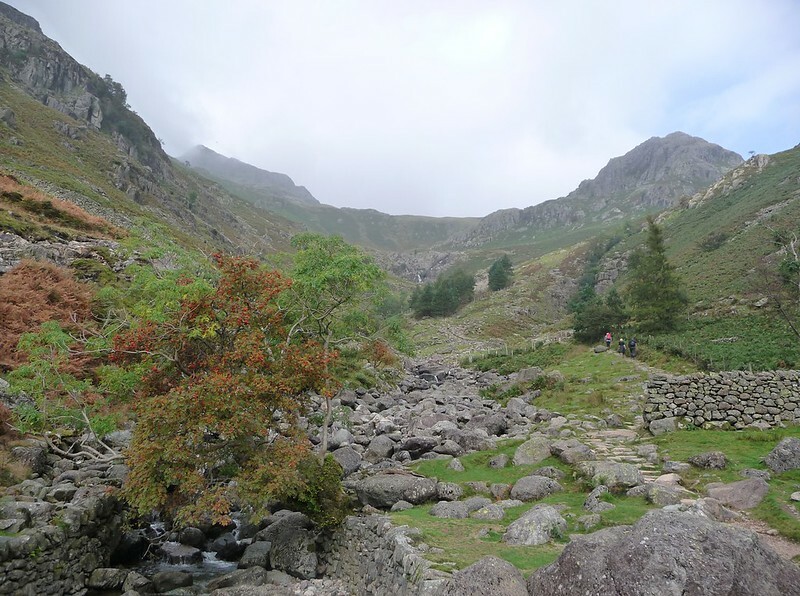 Fortunately alternatives were plentiful as every one of the numerous footpaths leading out of that valley delivered the walker to one spectacular location after the other. 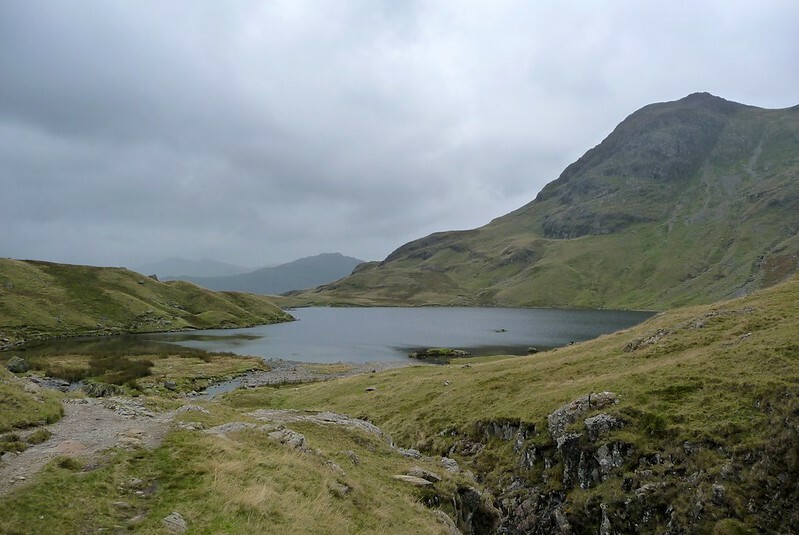 On recommendation from Emma's dad however we had to give Stickle Tarn a look which had the added bonus of being within walking distance of our accommodation at Green Howe. Setting off under a clearing sky it wasn't long before the warming sun had banished a slight morning chill and cleared what little cloud had been present over the hilltops. An old barn proved to be particularly photogenic before our arrival at the intriguingly named New Dungeon Ghyll. 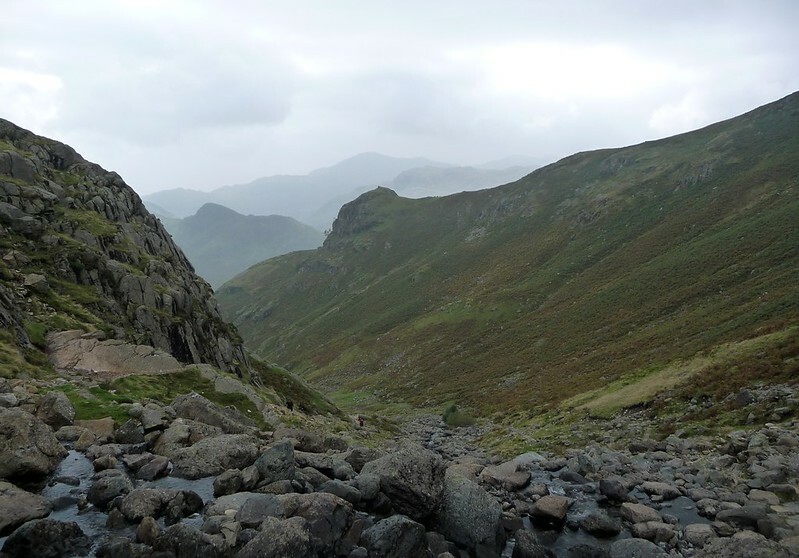 Dating back to to the early 1800's it was to be the real start of our walk as from here we began to climb towards the tarn alongside Stickle Ghyll. This was also the first of several times where our OS map was to prove inaccurate, a surprise considering the popularity of this area and the usually infallible nature of what must be some of the best mapping in the world. Where our map indicated that we should climb to the west of the river we instead found our route blocked and a very well defined path winding its way along the eastern bank. 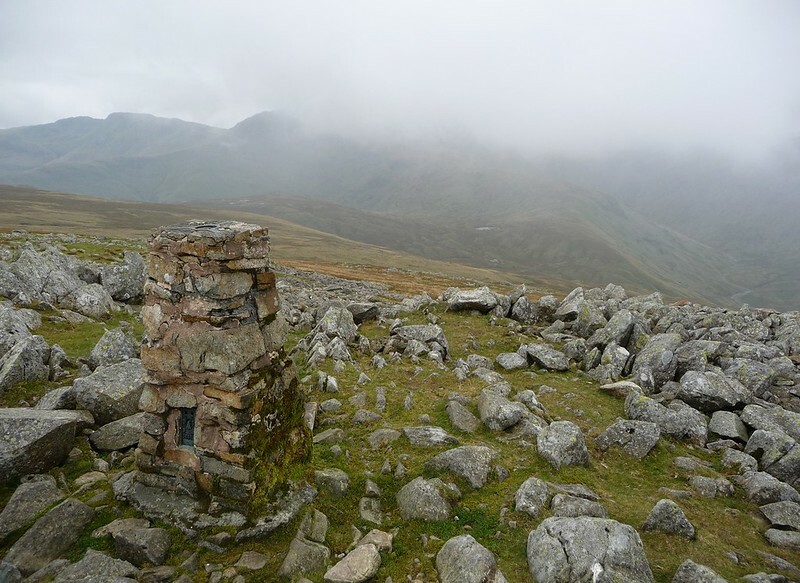 Not a major difference but this change had clearly caused difficulty for one group of children on their Duke of Edinburgh expedition whose leader had decided to follow the map religiously. Even at a distance I could see that his compatriots pleas to detour across to where everyone else was walking were falling on deaf ears as they continued to scramble over scree slopes and landslips. They do say that power corrupts. Near the top of that initial climb we had to negotiate a large group of youngsters on a field trip who I have to say made me quite jealous. I certainly never got to visit such dramatic locations whilst at school but I guess that's what you get for growing up in the Midlands! 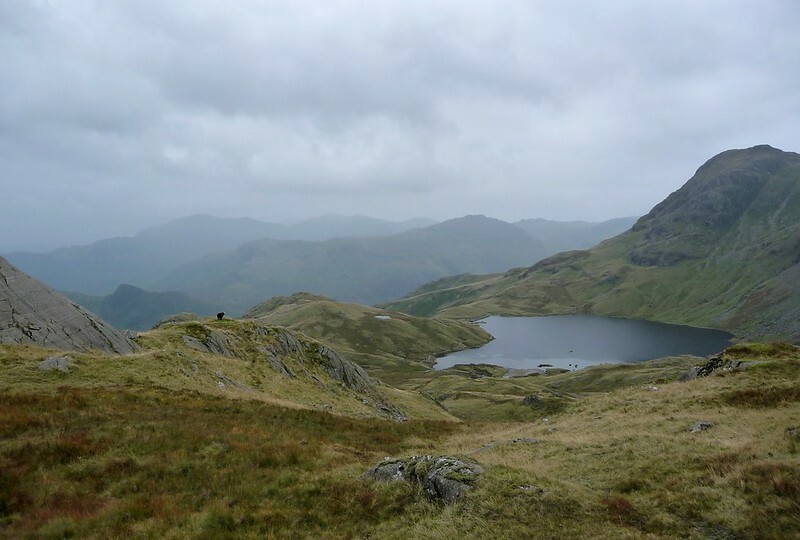 Fortunately their slow progress didn't hold us up for long and within a few minutes we'd arrived at the dam behind which sits the dark and dramatic waters of Stickle Tarn. I can certainly see why Emma's dad had been so eager to extol its virtues. 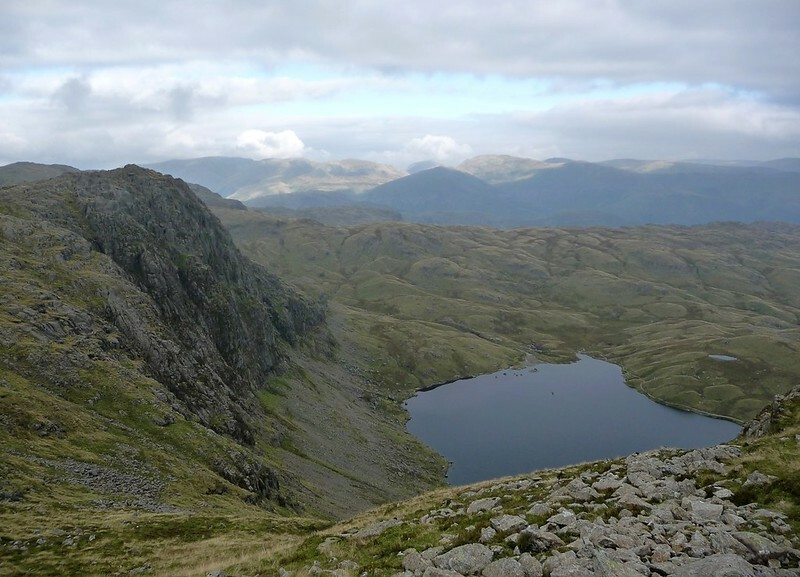 Lunch was taken overlooking the tarn with entertainment provided by a few crazy climbers ascending the vertical cliffs beneath Harrison Stickle. 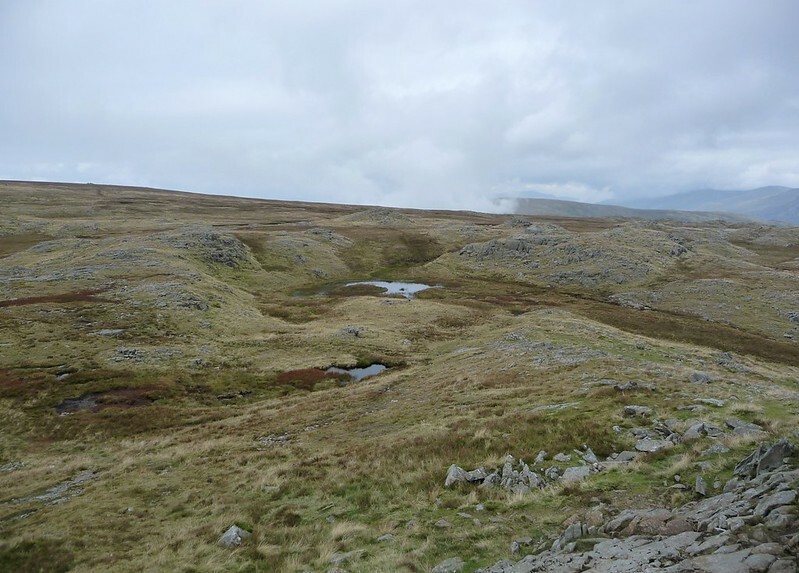 Our own adventures from here were unclear as in truth we hadn't planned anything much beyond the tarn itself. Pulling out the map a circular route was quickly decided upon that would take us up to High Raise and back down via the Langdale Pikes. Not long after setting off though we once again came upon a problem with which I am all too familiar. What looked to be a well defined path on the map was completely invisible on the ground necessitating one of the only times I have ever used a compass. 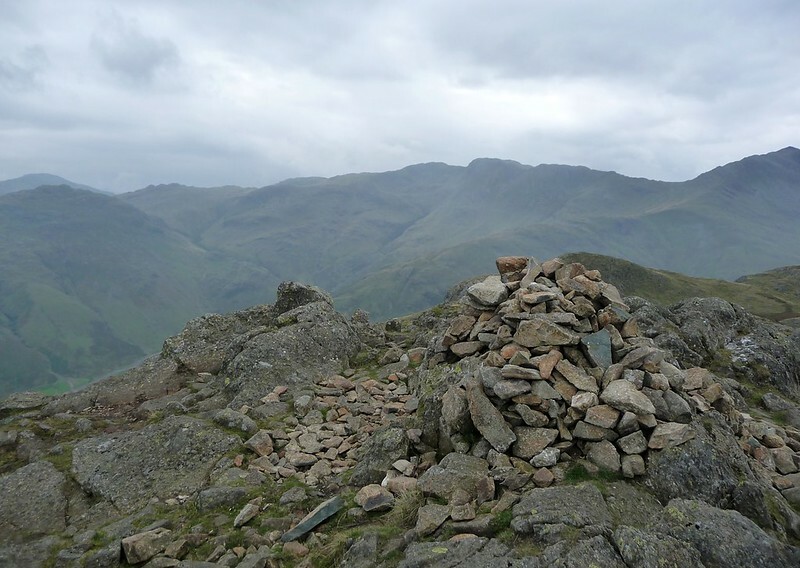 To say that I was chuffed when it led us to exactly the right spot would be an understatement and from hereon the route to Sergeant Man was marked by a series of small cairns. 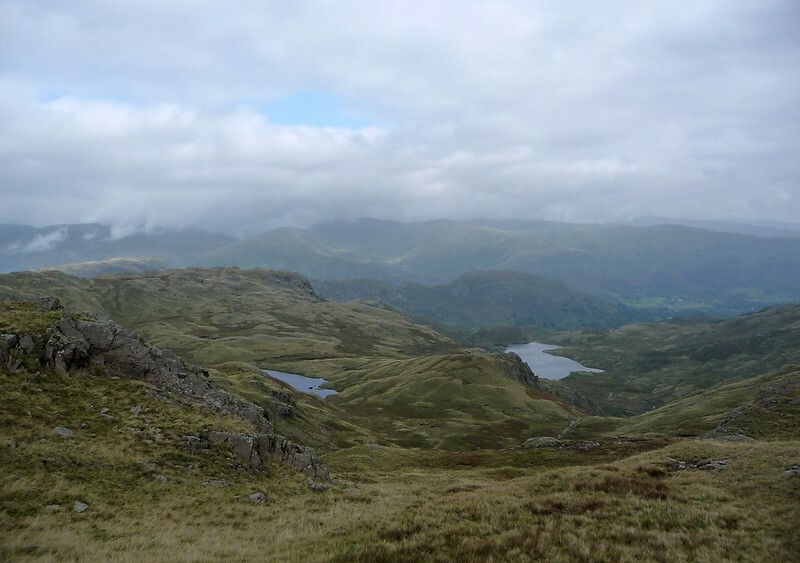 Below us the ground tumbled away revealing large swathes of English countryside in all directions with Codale and Easdale Tarns glinting to our east and the rising mass of High Raise ahead. 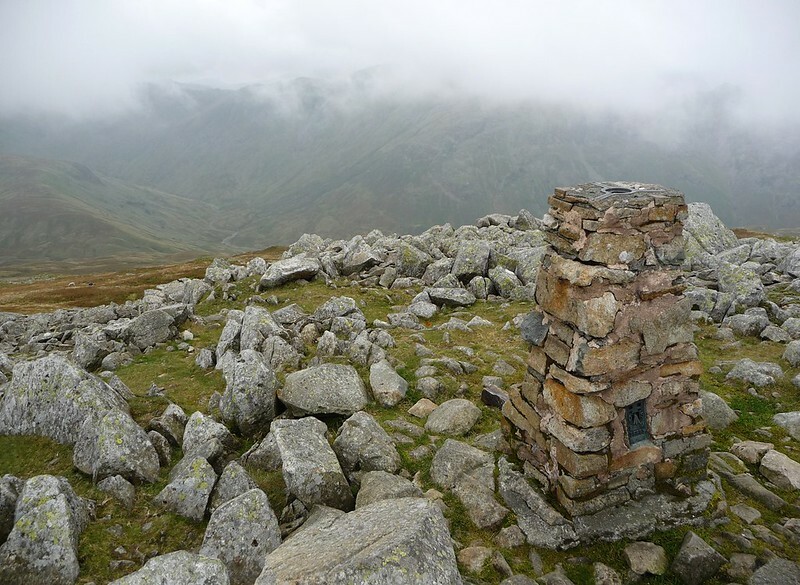 After a short breather at the outcrop known as Sergeant Man it was a gentle walk across the moorland up to a prominent summit cairn at High Raise. Despite studying the map I hadn't been prepared for the way in which the ground simply dropped away to the north revealing a series of deep, narrow valleys that reminded me more of our trip to Switzerland than Britain. Sadly we only had a few minutes to enjoy them before a layer of cloud which had been slowly but inextricably creeping forwards plunged us into a misty darkness. In no time visibility dropped dramatically but having had the foresight to take a bearing towards our next destination we had no trouble in dropping height and clearing the cloud base. Moving across the grassland several more cairns were passed before a short but steep climb found us at the top of Harrison Stickle and then finally Loft Crag. 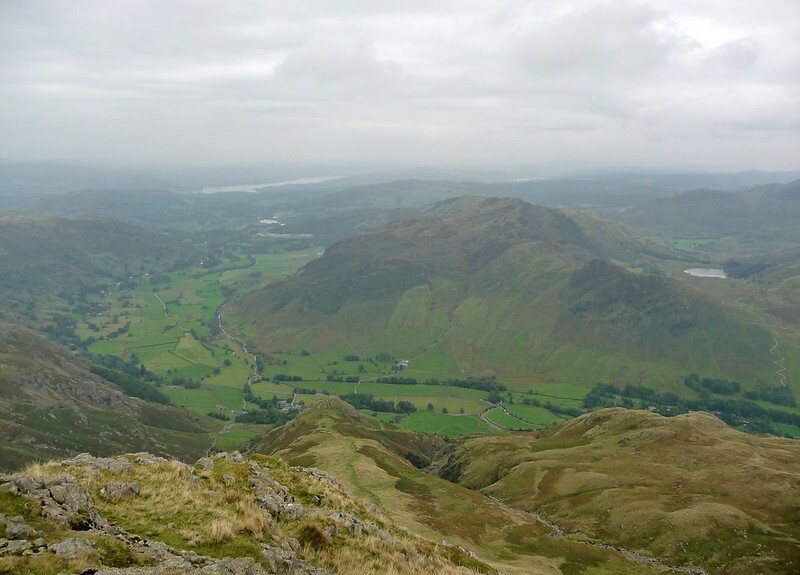 If the drops mentioned above had been impressive these were even more dramatic with a virtually uninterrupted chasm back down to Great Langdale. Even better was that the sun had once again returned. With time ticking on it was with a lingering look that we decided that the third of the Langdale pikes, Pike of Stickle, was a little out of reach if we were to happily make it back home with time to spare. 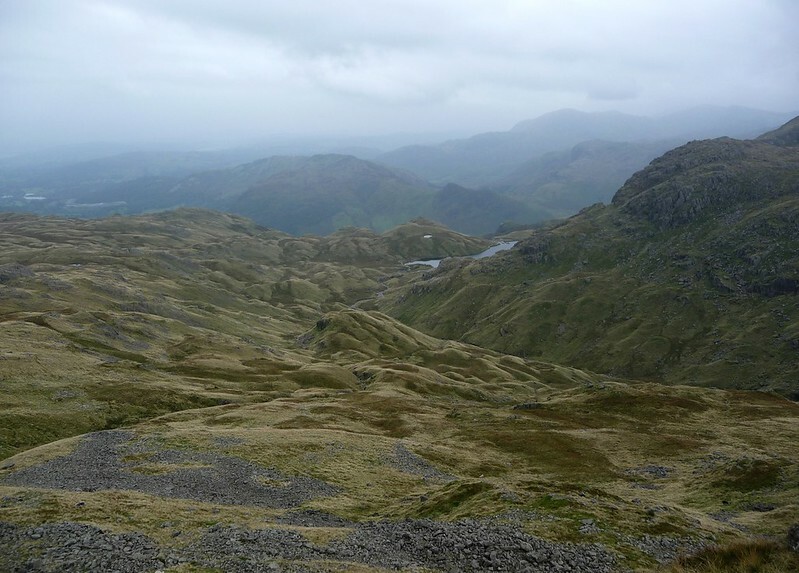 Instead we turned south-east to take the steeply descending path across to Raven Crag and our original starting point. Out of the slight breeze that had been keeping us cool all day we warmed up rapidly to the point where it felt more like the height of summer than a last hurrah before the wettest winter for over forty years. What a walk and what a location, easily making it into my top ten destinations. If you ever get chance to pay a visit yourself I highly recommend it, just not if you're afraid of heights. I made a somewhat similar photo essay of a walk in North Yorkshire last year. It's part of a larger set on Flickr, but if you start here and advance you can follow it, the title and descriptions of each image tell the story.